I have received the below call to action from RR Anderson. All completely original no doubt. They're crazy. It's like everything everywhere is going crazy, so we don't go out anymore. We sit in our cubicle, and slowly the world we are living in is getting smaller, and all we say is, 'Please, at least leave us alone on the LISTSERVE. Let me have my peanut-butter sandwich and my internet and my steel-belted radials and I won't say anything. Just leave us alone.' Well, I'm not gonna leave you alone. I want you to get ATTACHED! I don't want you to protest. I don't want you to riot - I don't want you to write to your city councilman because I wouldn't know what to tell you to write. I don't know what to do about the depression and PEAK OIL and the TERRORISTS and the crime in the street. I want you to get on your hands and knees, AND DRAW! DRAW with OUR CHALK (while supplies last). Spill your hopes and dreams onto the ground for ALL TO SEE and through doing so RECONNECT WITH THE CITY YOU'VE FORSAKEN! Chalk Challenge No. 8 is made possible through charitable donation by Hilltop Artists in Residence PLUS EXTRA BONUS--John Hathaway of THE NEW TAKHOMAN fame. THAT'S RIGHT. The winner will design a custom glass 'best illustrator in the universe' trophy AND a 1930's vintage HARD BOILED private detective's FEDORA once owned by Mr. Hathaway himself. As of 12:20 a.m., there is a zero chance of rain. Chalk Off Challengers, spectators, bloggers, politicians, lurkers and everyone interested has been invited by Chalk Off Challenger Dawn to the first Frost Park Chalk Off party. Come on down and get jacked up on fresh coffee and sweet desserts at Corrine's, to take your mind off the chalking madness. The more the merrier, so lets make this the happiest hour. Let me know if you are planning on going, so I know about how much coffee to order. Note: the Corina gathering will take place while active voting is still taking place for today's event which should give it some edge. by Wings_of_Change on 5/30/2008 @ 1:07am well count Me in for the Corina Party! by jenyum on 5/30/2008 @ 6:54am Up all night with sick kid. We will not be there today. Have fun! by Elle on 5/30/2008 @ 8:51am Oooh, the Corina's party sounds fun. And (although not at lunch time) I'm child free tonight. Might convince the trusty husband to stop by for a little bit. by scout on 5/30/2008 @ 9:10am The (Garfield artist) kid's name is Jeremy Scott, which has been pointed out by said kid or said kid's relatives on more than one occassion. Let's name him - go Jeremy! by izenmania on 5/30/2008 @ 9:24am For living two blocks from it, I've actually been inside Corina exactly... never. Will probably be there, pending when I leave work. Will be at Frost Park, of course. But probably won't draw. No ideas. by KevinFreitas on 5/30/2008 @ 9:41am See everyone at noon and hopefully tonight at Corina as well. Happy Friday! by NineInchNachos on 5/30/2008 @ 11:17am izenmania... No ideas? For real? I think it is time for somebody to BREAK OUT OF THE NORM! also to my friend Jeremy Scott. ..
by izenmania on 5/30/2008 @ 11:23am I am not going to draw Norm. Anyway, I prefer to only draw when I have an original idea, rather than re-hashing an old one. I'm sure there will be plenty of folk to fill the sidewalk space. by Erik on 5/30/2008 @ 11:36am thanks volcano crew! Yes, I see that they have put up your poster for today. 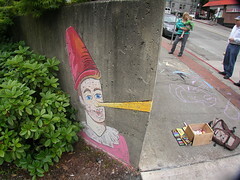 Also, it looks like Frost Park Chalk Off Competition is now a supporter/sponsor of Exit 133. Last week, RR's win may have been partially attributable to izenmania's close up picture(s). I wonder more will chose this method again this week? Dry. Clouds look to be clearing away opening up blue sky. by izenmania on 5/30/2008 @ 1:34pm I do have a variety of close-ups, but don't know that any capture much that won't come through in the wide shots this week. by NineInchNachos on 5/30/2008 @ 2:11pm here's what I got... start your engines! as in voting machine engines! by izenmania on 5/30/2008 @ 2:15pm RR, you have that marked as "Dawn's Glass Lady". Didn't Dawn do the flowers in the panel next to the glass lady (who is labeled "Goddess of Tacoma")? Plenty more from the action as well. My vote goes for Dave's Kalakala and Wave work. by NineInchNachos on 5/30/2008 @ 2:24pm oops fixed. my god stowe's piece is amazing. Andrea very dynamic.. powerful... I can feel the heat. Lance very clever use of folded concrete. Also I am attracted to anything with Kalakala... going to be tough. by Wings_of_Change on 5/30/2008 @ 2:35pm wow... it just keeps getting better! by Elle on 5/30/2008 @ 2:39pm wow, this is the first week I'll have to a) not vote on my own piece (which I did one... do you know which one it is?) and b) vote solely on photos. I like that I was able to see works in progress, but knowing a bit about most of the artists helps I suppose. Andrea, your work is amazing in person, but in photos leaps out. I've noticed that week after week. James, I was intrigued while talking to you, but after seeing Kevin's shots it truly looks like you carved a piece into the concrete. Lance, kudos for creative use of space and hiding behind the bush. 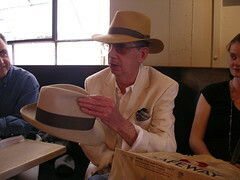 Nick, very Beever-esque. Dave, the detail is incredible. by izenmania on 5/30/2008 @ 2:45pm Did you draw the curb-gnome, Elle? by Lance Kagey on 5/30/2008 @ 2:48pm I vote for Pinocchio. Like RR said, "It's like a Hallmark Card." Did you see the detail on that thing? by Dianne on 5/30/2008 @ 2:49pm I really like the originality of Ariel's Tacoma Goddess. She had an amazing creative idea to represent Tacoma as a person. However, I am voting for Jeremy's Garfield Godzilla visiting Tacoma. I am pretty sure this is what happened to some of those downtown buildings that disappeared and were replaced by parking lots. by tommyllew on 5/30/2008 @ 2:52pm I vote for pinocchio. I like the way he hides in the bushes and kind of jumps out at you. Not unlike our beloved mayor. by NineInchNachos on 5/30/2008 @ 2:52pm Hey Dave , is your floating KalaKala for sale? by Lance Kagey on 5/30/2008 @ 2:59pm I pencil my vote in for that pinocchio character. So here are Mine! enjoy!! 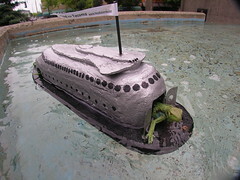 by jamesstoweart on 5/30/2008 @ 3:13pm I for one want to petition Dave to donate the floating ferry lizard KalaKala thing for next week's secondary artistic/quirky prize/trophy. I for one would display it proudly. I'll vote later after I drink chalky coffee and watch people consume cake. Also, and I am not sure cause I am an artist and can't do even simple math... but did Kagey just vote for himself twice? That is a major karma challenge (great band name). by NineInchNachos on 5/30/2008 @ 3:13pm Lance is proving himself to be our chalk art innovator. First to use the wall... first to use the sharp corner "fold" effectively . It is exciting to witness the technological evolution of our event. by Lou Lou on 5/30/2008 @ 3:13pm Love Pinnochio with the pencil nose. I vote for him. by Erik on 5/30/2008 @ 3:15pm Nice photo sets. I will post mine for later voters. It will be a tough decision tonight. See everyone at Corina's Bakery at 5:00 p.m. today. A Chalk Off party right in the middle of voting. The News Tribune photographer (with intern) taking some shots and conducting some interviews. We will see which drawing(s) get published. by justagirl on 5/30/2008 @ 3:16pm I believe Tom is Lance's brother? by NineInchNachos on 5/30/2008 @ 3:17pm Stowe, your work and Andrea's work fit well together. It's a good BEFORE and AFTER narrative. by rippen on 5/30/2008 @ 3:22pm i vote for Lance Kagey! 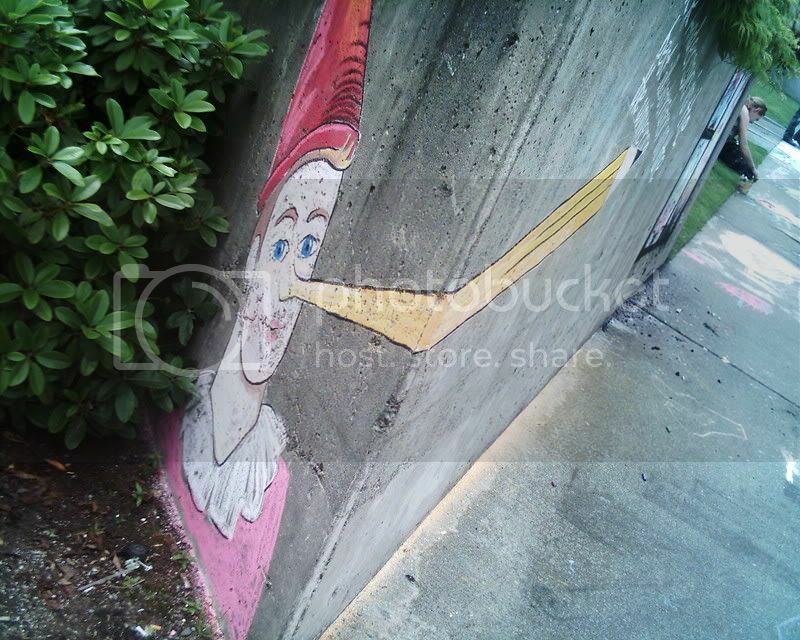 by Lance Kagey on 5/30/2008 @ 3:23pm Who did that great pinocchio? by izenmania on 5/30/2008 @ 3:24pm but did Kagey just vote for himself twice? by AP on 5/30/2008 @ 3:30pm I vote Kagey. Andrea's is phenomenal as well. by Nimsy on 5/30/2008 @ 3:30pm I vote for Pinocchio. That guy knows his way around a corner. by Chalk on 5/30/2008 @ 3:33pm I cannot tell a lie. Pinocchio rocks. What a beautiful angle! by nerffjones on 5/30/2008 @ 3:36pm I love the use of the corner in Mr Kageys. Pinocchio gets my vote. by droid116 on 5/30/2008 @ 3:37pm I think there are some great entries this week. 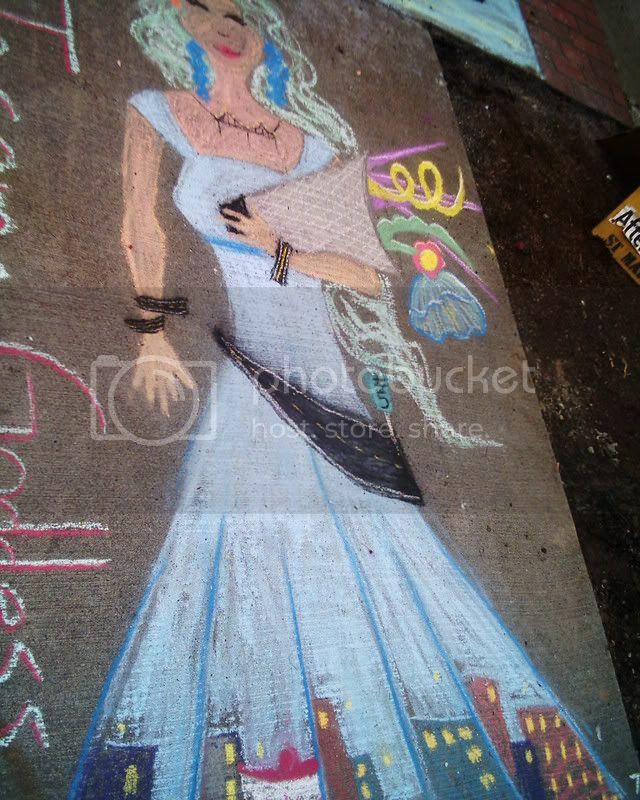 I am going to have to go with Andrea's hot shop chalk art. by Erik on 5/30/2008 @ 3:38pm Lance looks to be acclimating to the conditions of the Frost Park Chalk Offs by voting for himself. by scout on 5/30/2008 @ 3:41pm I love the vicious fervor in Garfield's eyes and that he's taking out one of the evil ever-presently-everywhere parking garages. Andrea's is really great and action packed and I want to eat that moon. Stowe's is a wonderful still piece, RR's council character is a very good likeness, and Lance's Pinocchio is impressive - who would've guessed he had that slightly nasty streak in him! Oh crap, ok I vote for Andrea - color, action, Tacomaness, Chalk Drama - it's got it all..
by Lance Kagey on 5/30/2008 @ 3:41pm Just trying show my enthusiasm for a great organization - Hilltop Artists. They deserve all the buzz we can give 'em. so keep voting friends. I agree with Elle about Andrea's pieces in photos. Her pieces are amazing in person but in pictures her stuff really leaps out. 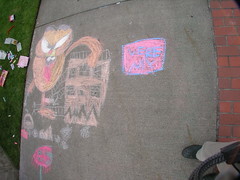 I loved Jeremy's Garfzilla. And special mention for my son, Barrett's, Dinosaur from watermelon seed and Banana shark (not pictured) because that's just a hell of an idea. by Where the World Spins on 5/30/2008 @ 3:47pm I am voting for Pinnochio, he's soooo cute! by kpo on 5/30/2008 @ 3:51pm Ooooooh Pinocchio!! by kpo on 5/30/2008 @ 3:52pm Ooooh, I vote pinocchio! by grubedoo on 5/30/2008 @ 3:58pm PINOCCHIO. Comparatively the rest is balderdash. by Lance Kagey on 5/30/2008 @ 4:09pm I agree with Kenny Rogers, "you never count your money when you're sitting at the table." But I think that's 11 for pinocchio? 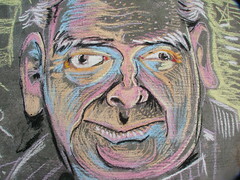 by Lance Kagey on 5/30/2008 @ 4:09pm IS that a stan shaw drawing, rippen? by Elle on 5/30/2008 @ 4:12pm Did you draw the curb-gnome, Elle? Good guess. Yes I did do that one. I was limited by the one piece of chalk the child brought me and the one I stole from him. Here is my set. It is of works in progress as I didn't get to stay until the end. by gr8-grub on 5/30/2008 @ 4:21pm Way to go Dawn! Awesome museum abstract, you get my vote babe. by nalph rader on 5/30/2008 @ 4:24pm I really like Andrea's work. I really like Stowe's work. I really like Andrea's work. But I'm voting for Pinocchio, because it brings a little edge to this competition. 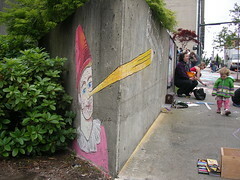 by deedle on 5/30/2008 @ 4:33pm PINOCCHIO. Definitely a nose above the rest. by deeble interactive on 5/30/2008 @ 4:36pm I'm voting for Lance because his 'art' implies that RR Anderson is a prince of lies... which is true. by Dave L. on 5/30/2008 @ 4:37pm The new ideas people come up with continue to amaze me. Several pieces today made me laugh, like Pinocchio, Stoweâ€™s glass piece, and "Urban-Renewal" Garfield. Mr. University Place guy took his rightful place as RxR subject matter. Lanceâ€™s use of the fold was brilliant. Iâ€™m totally not-with-it; I had to look up â€œC.H.U.D.â€ and now I get it - Great. "maintenance hole" cover. The buildings from above was great. I loved the different ways glass was used as a topic. 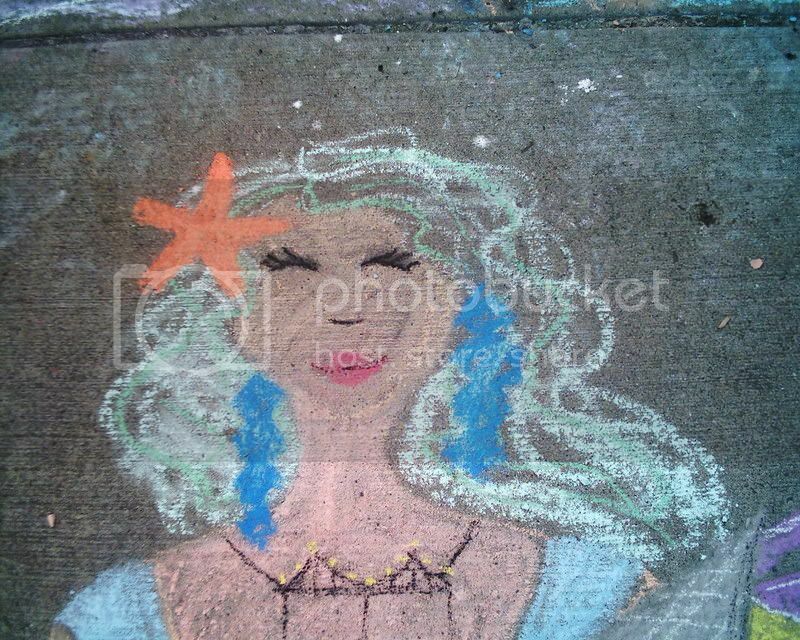 But I should leave drawing comic characters to Stowe â€“ itâ€™s hard to do, especially tiny ones in chalk. Apologies to Stowe and Hokusai. The floating Chalkalakala was something I threw together for fun in a few evenings with some carved foam, cardboard, a slab of wood and paint. And a lizard from Learning Sprout. Itâ€™s kinda sloppy, and I really didnâ€™t have plans on what to do with it afterwards. RxR, I gathered long ago that you like things transportation-related, so itâ€™s yours. Unless I have to meet you at Blackwater, Iâ€™ll bring it next time Iâ€™m at Frost. Itâ€™s the least I could do. I canâ€™t decide whether or not to vote for humor, subject matter, or whatâ€¦ But when I looked an hour later and saw the scene that our chalker-of-light (and heat) Andrea laid-down, I knew right away I had to give her my vote. If one of her glassblowers had Groucho glasses, I would have laughed, but in every other category, it made my jaw drop and grabs my vote. by Twisty on 5/30/2008 @ 4:44pm Fantastic work, everyone! Put down my vote for Andrea this week. by Mandiferous on 5/30/2008 @ 4:49pm I vote for Nick's bird's eye view of the city. Very impressive. by izenmania on 5/30/2008 @ 4:52pm I vote Dave. 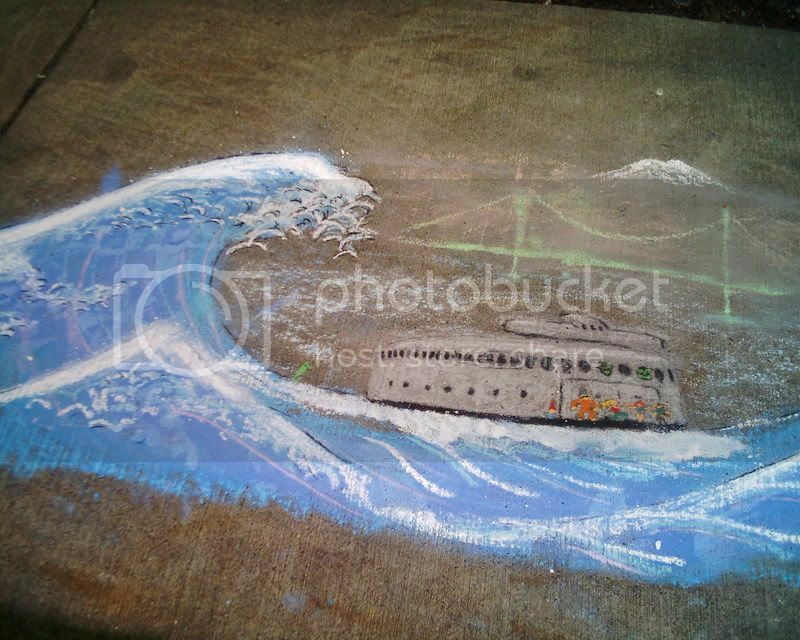 The waves turned out really well, and I liked his tiny renditions of the CLT (Chalk League of Tacoma) on the boat. Plus his real live boat prop made me happy. by seriffed on 5/30/2008 @ 4:52pm Pinocchio. by Tacomite on 5/30/2008 @ 5:48pm I vote for Stowe, those vases are amazing. by Elle on 5/30/2008 @ 5:52pm ooo, I still don't know who to vote for. Ummm... I'm going to have to go with Lance. For creative use of space and flexibility of pun use. by NineInchNachos on 5/30/2008 @ 6:06pm I gotta give my vote to the Beautiful Angle artist, Mr. Kagey this round. The One - Two Punch setup made my wife and I laugh. Lance deserves a win. it is a tough decision. Stowe and Andrea made the cement glisten and burn. If you were there you would see how this thing was full of energy. and the use of the color palette was clever. As for the other participants: Fantastic stuff. I have to give them all second place. 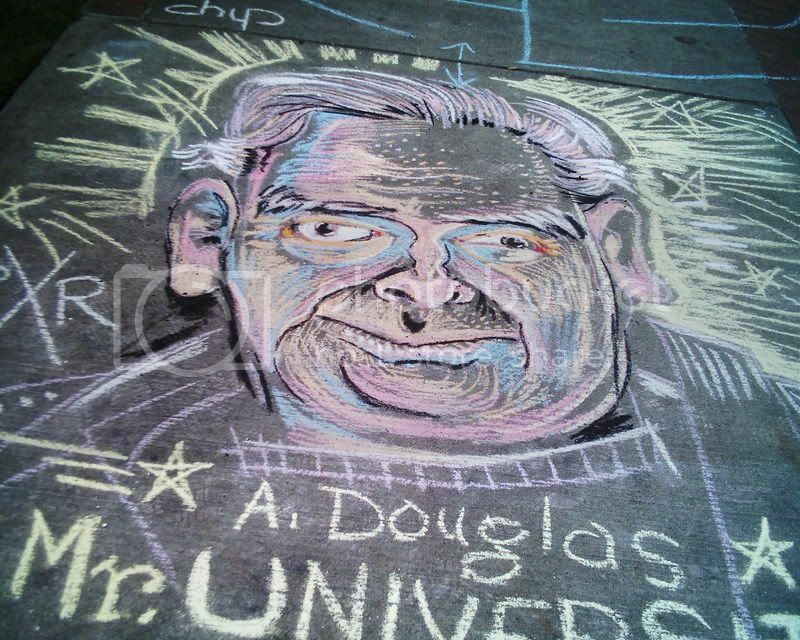 But, a very near winner this week was portrait of A. Douglas, Mr University Place. Why didn't I do a tiki this week? Well, I sort of did. If you look close at the manhole cover you will find the word TIKI in the grid pattern. So, the lid actually says, Tacoma Tiki. by NineInchNachos on 5/30/2008 @ 6:30pm for posterity. I knew what a chud was. Your first COMIC CRITIC street performance? 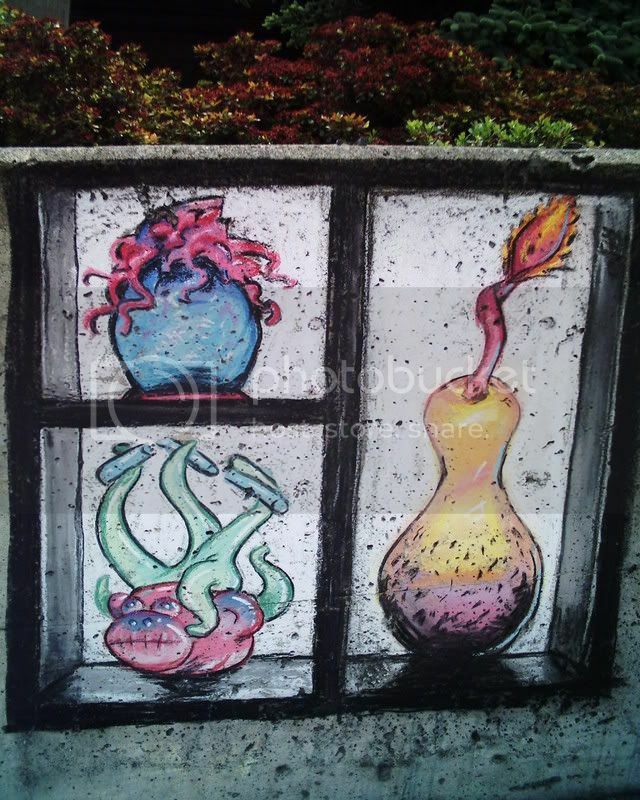 by Angela Jossy on 5/30/2008 @ 6:35pm I vote for Andrea's The Two Guy Blowing Glass. by Erik on 5/30/2008 @ 6:39pm Looks like Lance has assembled quite a number of first time voters otherwise known as zombie voting faction. Alot of votes still out there waiting to be cast. let's see, i need to go next door and enlist the neighbors. talk to you all soon. Still over 5 hours for voting. by elliekagey on 5/30/2008 @ 6:42pm Pinocchio reminds me of Italy. I love Italy. I vote for the wooden boy. by Lance Kagey on 5/30/2008 @ 6:48pm I think everyone of those votes come from thoughtful, decisive art afficianados. I wouldn't call them zombies. this is a great opportunity to teach my kids how to blog. by Lance Kagey on 5/30/2008 @ 6:56pm dawn, thanks for the cake event. that was nice. 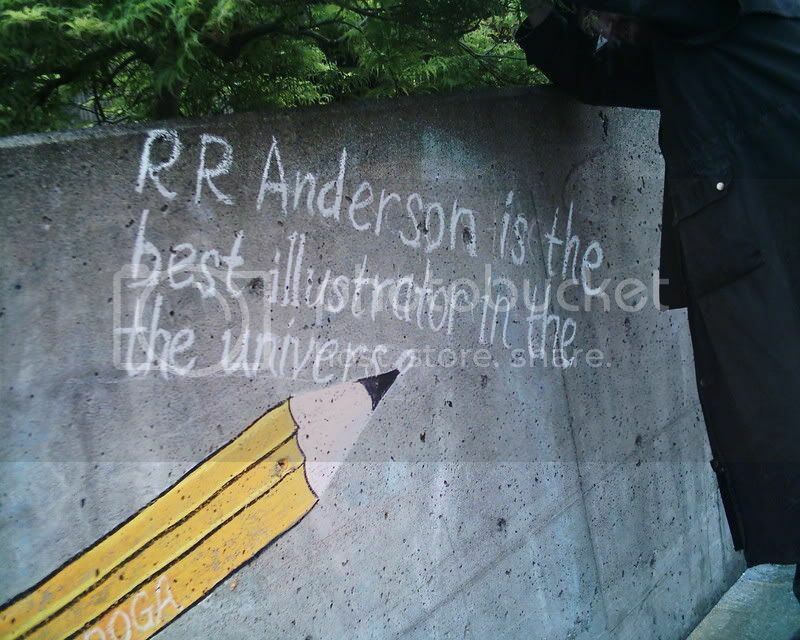 RR Anderson "Lonely University Place Guy"
by Erik on 5/30/2008 @ 7:13pm Very strong submissions as usual. Nice work Lance in the first two sided chalk entry with a surprise ending. Sort of like a story book. Beautiful Angle engages RR Anderson at last. Dave L's piece is great. Tempted to vote for it just because I love that much Blue. Ariel's showing a whole new side and Stowe's is a piece of art. RR's continual support of gadflys is impressive. So many I could vote for. Because it's good, to support the Hilltop Artists in Residence reference, to bring the voting closer, to bring out more votes and continuous nail biting excitement until midnight tonight, I will vote for Andrea's piece. by NineInchNachos on 5/30/2008 @ 7:27pm I missed the cake event! didn't get off work till 6:15 swung by Corina to reserve a fresh 1 WHOLE CARROT CAKE (last Friday's winnings). Nice new digs over there. by Wings_of_Change on 5/30/2008 @ 7:36pm yep, I missed the cake event too. sad panda. my GOD! Pinoccio is almost to 20 already! I wonder if all these voters will blog again next week??? hmmm? by LilChickadee on 5/30/2008 @ 7:40pm i like the TacomaGoddess. Ariel did a fab.job! lots of detail in her picture! by LilChickadee on 5/30/2008 @ 7:42pm my vote for the TacomaGoddess! by jenyum on 5/30/2008 @ 7:44pm wow. Spend a week away (oh my god, house of bad bad badness last night) and everyone just pulls out all the stops. I love everyone's work, there's a special place in my heart for Mr. A. Douglas because he randomly showed up with a big flag to lead my Very Sad Parade. I love the Kalakala, and I want one. 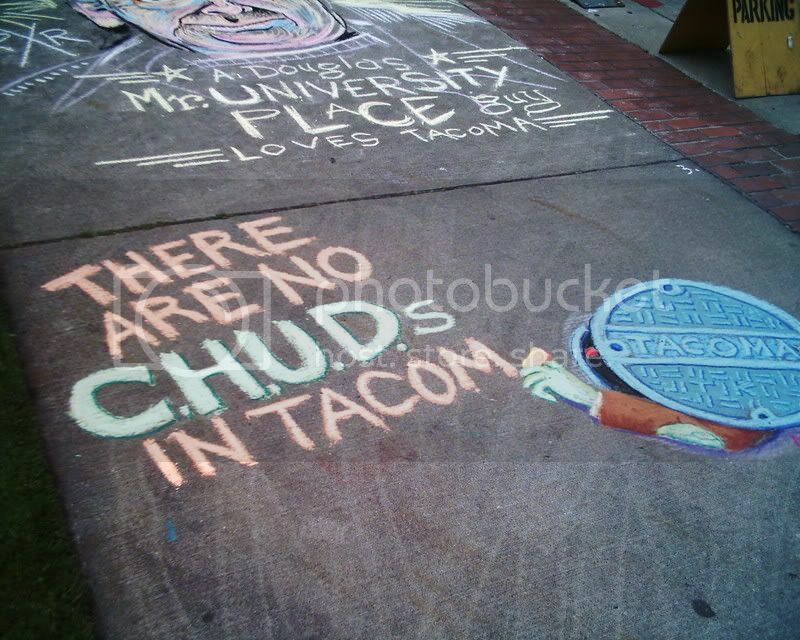 The manhole cover looks very 3-D, although I too had no idea what a C.H.U.D. was until further scrolling revealed the answer. Part of me wants to vote for Elle because I can relate to the kid only giving her one piece of chalk then having to leave early. I applaud Jeremy's break out Garfield piece, looking forward to what we'll see Garfield doing next week. The hot shop is amazing, as is everything Andrea has done. And I love the Tacoma goddess. Edited to add: I left out pinocchio! Amazing, and I love the multiple panels. by NineInchNachos on 5/30/2008 @ 7:46pm I've been charmed by the floating KalaKala sculpture . Ms. Darcy says she likes the School of Kokusai chalk wave the best... but she's to lazy to create an account to vote for it. So I offer this info as morale booster. 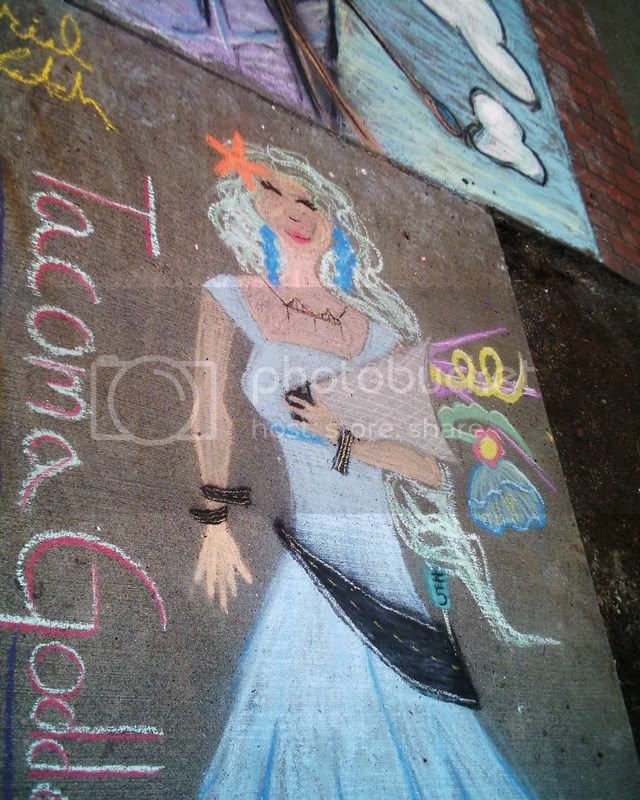 by mzkrug on 5/30/2008 @ 7:56pm TACOMA GODDESS by Ariel Latch!!!!! by ALT on 5/30/2008 @ 8:02pm Soooo many good ones this week! Not only beautifully rendered entries but cleverly used space and innovative ideas. I got a kick out of Mark Monlux's "Cannibalistic Humanoid Underground Dweller" entry. Great combination of illusion and cult movie references! 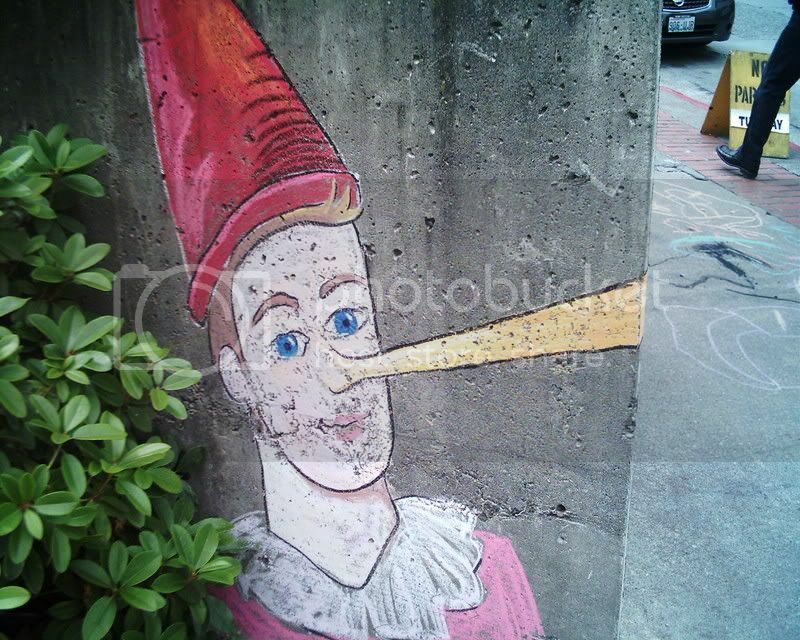 Lance Kagey's Pinnochio piece is not only colorful, clever, witty, and resourceful, but downright hilarious as well. To quote "Chalk":I cannot tell a lie. Pinocchio rocks. What a beautiful angle! Ha - even the comments have become creative pundits! Dave's tidal wave is beautiful and terrifying in its forcefulness. Stowe's rendition of those famous glass sculptures is colorful and eye-popping. I must admit however that I'm very pleased with the way my Hot Shop turned out. As I had broken my "no vote rule" and voted for Dawn's Frosty last week, so I must vote for my favorite this week. I vote for my Hot Shop - I like it. Plus I bled all over this entry. by Mark Monlux on 5/30/2008 @ 8:24pm 5 o'clock is when I pick my wife up at the park and ride. I so missed going to the bakery. Sigh. by Erik on 5/30/2008 @ 8:36pm Thanks Dawn for inspiring everyone to go to Corina's Bakery. It was nice that Julie, Mike and Kate from Corina's were all there. Should it be a weekly event? That could be dangerous. Chalkie bonding at Corina's Bakery. Dale L.'s secret chalking weapons. Ketchup bottles of chalk. I tried to explain the entire Chalk Off dynamic with him and showed him Stowe's poster in around three minutes. He had alot to process. by Twisty on 5/30/2008 @ 9:09pm The TNT showed up? It's about time!!! by Frinklin on 5/30/2008 @ 9:32pm Damn, I'm sorry I missed this today. An excellent chalkariffic day. I love the Kalakalalalalaa and Pinocchio is very cool, but my vote goes for Andrea's Hot Shop. 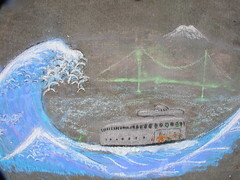 by Amanda D. on 5/30/2008 @ 9:34pm My vote for Dave's wave drawing. Boats are always winners for me. The rest of the picture was also pretty swell. by NineInchNachos on 5/30/2008 @ 9:40pm fans of our little chalk event will enjoy this article from our friends over at the Volcano. city manager Eric Anderson is solicited for an opinion about the sport of Frost Park Chalk Art..
by Erik on 5/30/2008 @ 10:16pm city manager Eric Anderson is solicited for an opinion about the sport of Frost Park Chalk Art..
Today being the 8th Frost Park Chalk Challenge, I thought it fair to ask whether the city was facing any extra cleanup burden because of the weekly chalk centered gatherings. 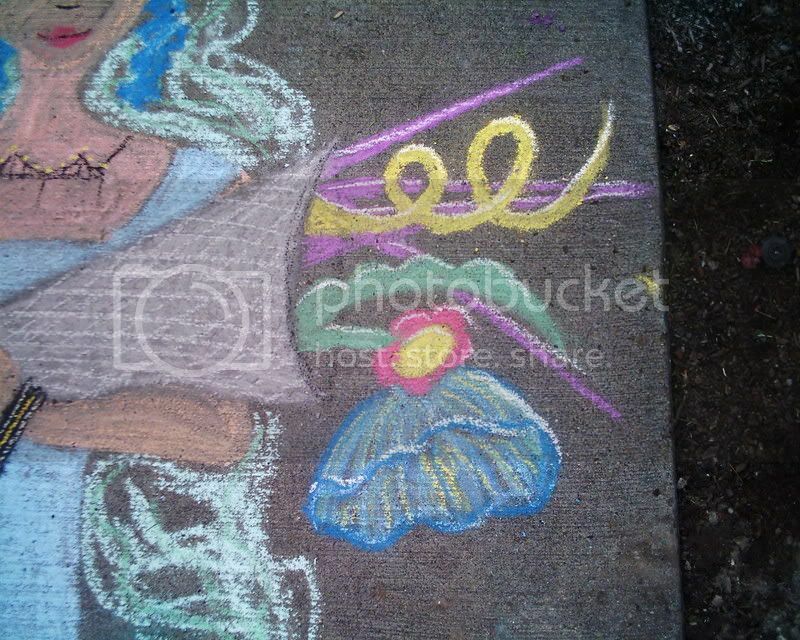 Anderson had no problem with the events, asserting that the chalk being used comes off in the rain. To his knowledge no extra work was being put in to clean up. The chalk off has most likely saved the city countless funds in security costs. Alot of people stop to look at it after the event is over and it seems to have changed the dynamic of the area. 1 hour and 41 minutes left. Alot of regular Feed Tacomans have not weighed in yet. 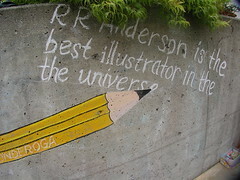 Looks like the title of "Best Illustrator in the Universe of Tacoma" for this week is still up for grabs. Plus I bled all over this entry. by Cathy on 5/30/2008 @ 10:22pm It's a hard decision, but I know there's a fedora at stake, so I'm going to focus and post my vote for the ferry boat/wave. by morgan on 5/30/2008 @ 10:29pm Another great showing! I'm glad I got to see it in real life today- photos really don't do them justice. As amazing as Andrea's Hot Shop was (that would make a great poster!)... and as much I appreciate someone who comes all the way from UP to make comments at city council meetings (for a city he doesn't live in - who does that?!)... and as much as I like anything Kalakala (especially with Japanese serigraph waves)... my vote goes to Lance's pencil nose. It took him a while to devolve, but he did and it worked. And for that I am thankful. Well done, Lance. by Hilltopmom on 5/30/2008 @ 10:33pm Amazing drawings this week. Tough decision. My vote goes to Andrea. Final vote: (Ack, afraid ...) Dammit ... who do I vote for? The use of the corner smacked me over, straight onto sitting on the sidewalk in awe. Great color. Diverging from his normal topic. Breaking barriers beyond simply vertical vs. horizontal. The context of the park's activities and the chalk-off's founder and most recent winner. This entry was so very in the moment. by dawntown on 5/30/2008 @ 10:44pm I vote for me! by texinthecity on 5/30/2008 @ 10:55pm NYC votes for dawn!!! :D We got yo back gurl! by justagirl on 5/30/2008 @ 11:01pm I vote for Andrea's brilliant work. I LOVE the energy in Andreas hot shop...i swear I can feel the heat from the glory hole. Everyone's entry was amazing this week. by jamesstoweart on 5/30/2008 @ 11:58pm I am finally back from late night Christian School Donkey Basketball and ready to vote. First, let me say that I had a great time watching everyone eat cake at Corrina's. Thanks Dawn, Eric, Kevin, Lance, Elle, Dorene, Courtney, Barrett, Audrey, Elle's Husband, Corrina's Employees and anyone else I might have missed. 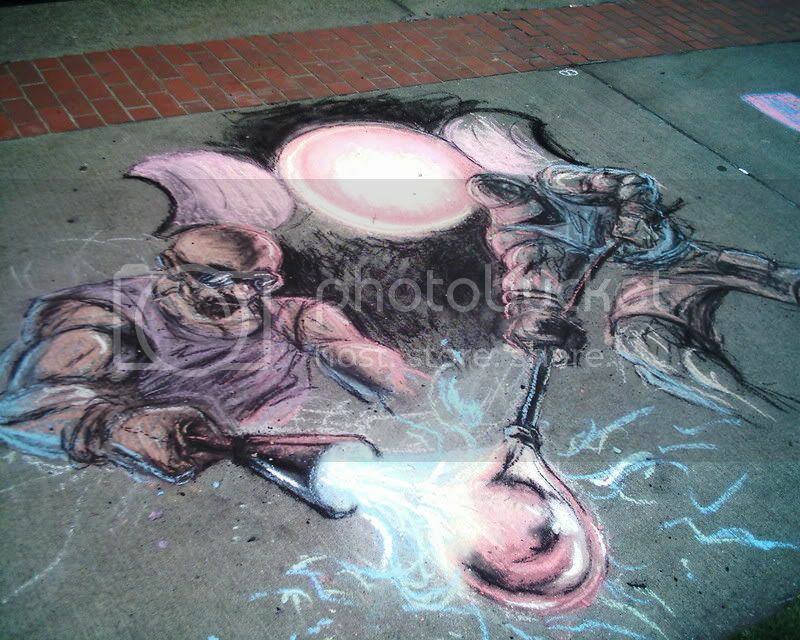 It was cool to hang out without feeling the need to destroy people with mad chalk skills. Now...voting. Who am I to stand against the awesome power of a LANCE-SLIDE!!! His humor, execution, subject matter, creative surface use, zombie wrangling and blatant disregard for karma's fickle wrath earns him my vote this week. You are truly the Greatest Illustrator in the Universe of Tacoma. bonus kuddos to Dave L. for floating art and Mark for busting out the CHUD reference. 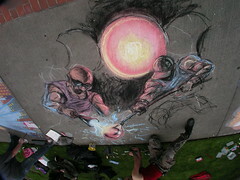 by Erik on 5/31/2008 @ 12:36am Episode VIII represent yet another record for Frost Park Chalk Offs. A total of 50 votes cast. Strong first and second place finishes by Lance and Andrea, respectively. Lance appears to have secured more votes than any competitor in any single Episode. Commentary: In my view, Episode VIII represented the date in which Lance Kagey unleashed himself and fully engaged in Frost Park both in the style and voting factions needed to win. Yet, he held true to the strength of his art form. Week after week, Lance has endured one verbal jab after another from RR without complaint. 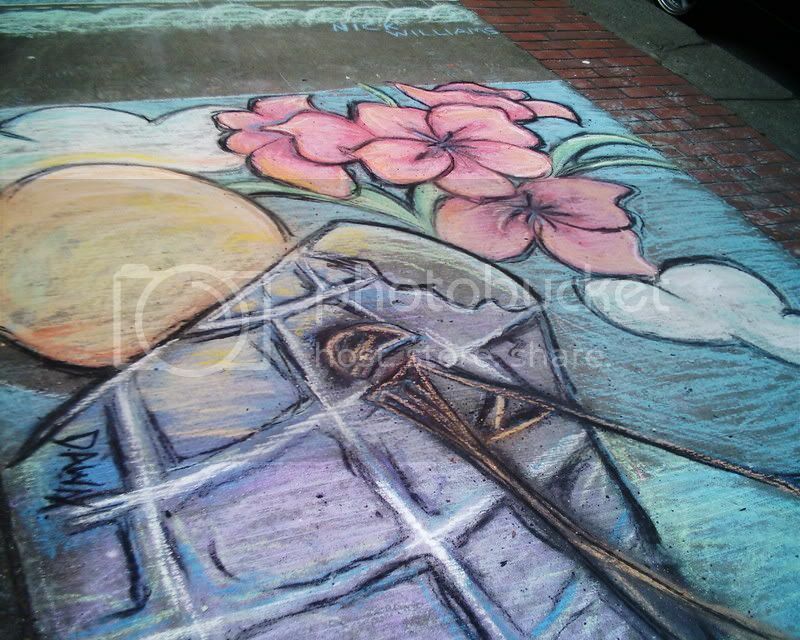 In Episode VIII, Lance finally gave RR his due by transforming RR's continual boasts into a chalk art submission that would defeat him. RR, Iâ€™d like you a lot more if you werenâ€™t so full of yourself. 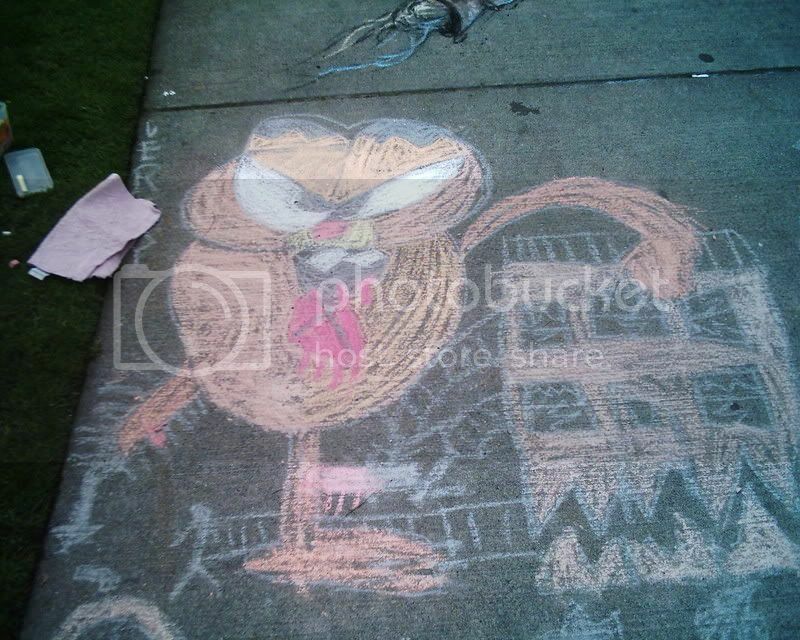 That said Iâ€™ll bring chalk next Friday and show you what it means to draw. Although the bravado title was meant jestfully in earlier episodes, the increasing caliber of the Frost Park Challengers is making the title more literally true each week. by Erik on 5/31/2008 @ 1:13am I see I left it out above. However, Andrea received 11 votes securing second place in Episode VIII. by NineInchNachos on 5/31/2008 @ 7:37am gosh.. this was a nail biting episode! Chalk, Blood, Mustering the Base... it had everything. Lance, you've won hearts and minds. Congratulations! by Raido on 5/31/2008 @ 8:53am I attempted to post a vote for Andrea at about 11:50 last night, but it didn't actually post. Just wanted to have my say since my vote didn't make it last night. Lance's illustration is also excellent. No sour grapes. by dawntown on 5/31/2008 @ 9:08am Thank you Kathy!!!! Im stoked about the consolation prize. Everyone really busted out the madness this time, so we all win! by izenmania on 5/31/2008 @ 9:27am In your mention of the three-way tie with three votes for third place, you seemed to have missed that Dave L's Kalakala got four votes (maybe five, I can't tell if RR actually voted for it, or was just in love with the sculpture and mentioning that Darcy would have voted for it). by Lance Kagey on 5/31/2008 @ 10:18am Now that I've manipulated the vote to my advantage, I have to say Andrea's hotshop image was so amazing that it deserved to win. Thank you Kathy for arranging the Hilltop Artists prize. I'm anxious to add some more glass to my collection. and the hat is pretty sweet too. I hope it fits.I have a pretty big head and not just from this glorious win. thanks to all who voted. these are my faithful homies. by kathy on 5/31/2008 @ 10:21am Lance-Slide!!!! Oh boy! this will be FUN!!!! I can't wait to see what custom glass piece Lance would like to see made. We will set a date, Glass creation will be an evening event (5:30-8:00 most likely) perhaps we will enlist some "special guests" to aid in the creation process. 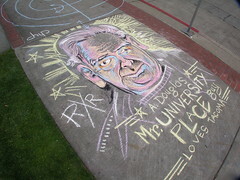 I'll let the Frost Park Chalk Crew know when, and have you RSVP...perhaps a bit of a pot luck too? by kathy on 5/31/2008 @ 10:33am OK Lance, now I understand the absolute certainty in which you told me you would win this week! I really hope that ALL of the challengers will join us at the hot shop. (S.O. 's in tow, of course) As well as our fabulous promotors...Erik and Kevin. Special thanks for all your hard work. I'll keep you all posted!!! Thanks to all of you for your support and for making Friday noon a time to look forward to!!!! Y'all rock! 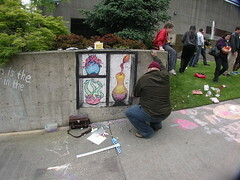 by Lance Kagey on 5/31/2008 @ 4:06pm can't wait to play with molten glass on a stick with greg and the gang at hilltop. by Erik on 5/31/2008 @ 7:05pm ...I have to say Andrea's hotshop image was so amazing that it deserved to win. View the full size to read the caption. by Erik on 6/2/2008 @ 4:50pm Ok.
No. Its not a "make over." The chalkies are far too sophisticated for that. by izenmania on 6/2/2008 @ 4:54pm Everyone not drawing chalk art must stand completely motionless?